After 40 years in an Illinois closet, an important Russian collection of 19th-century kabbalistic amulets—bearing handwritten, magical invocations for health, fertility and finances—were brought to light by a series of coincidences. 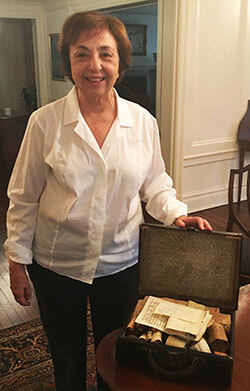 Eleanor Coe explained that the suitcase had been entrusted to her father, Boston doctor Max Brodny, during a 1950s trip to Moscow, where he had met a Chabad rabbi eager to smuggle the vintage scrolls out of the Soviet Union. Back home, however, “nobody knew what do with it,” Derby recalled Coe telling her. Derby immediately contacted Kabbalah experts at the National Library of Israel. Yoel Finkelman, a curator in the collections department, was intrigued. “The study of Jewish magic is in a period of great expansion,” he explained. Derby, an active member of Hadassah Chicago-North Shore, flew the scrolls to Jerusalem, where scholars determined that the nearly 90 parchment amulets were produced in Eastern Europe, Palestine and North Africa. “Only rarely does material that can make such a contribution to research come along in this surprising way,” said Finkelman, whose team will digitize and study the scrolls.